Following Christian's Wayland in Fedora Update post, and after Hans fixed the touchpad acceleration, I've been playing with pointer acceleration in libinput a bit. The main focus was not yet on changing it but rather on figuring out what we actually do and where the room for improvement is. There's a tool in my (rather messy) github wip/ptraccel-work branch to re-generate the graphs below. This was triggered by a simple plan: I want a configuration interface in libinput that provides a sliding scale from -1 to 1 to adjust a device's virtual speed from slowest to fastest, with 0 being the default for that device. A user should not have to worry about the accel mechanism itself, which may be different for any given device, all they need to know is that the setting -0.5 means "halfway between default and 'holy cow this moves like molasses!'". The utopia is of course that for any given acceleration setting, every device feels equally fast (or slow). In order to do that, I needed the right knobs to tweak. But what do they mean, exactly? And what exactly does a value of 0.4 represent? Pointer acceleration is nothing more than mapping some input data to some potentially faster output data. How much faster depends on how fast the device moves, and to get there one usually needs a couple of steps. The trick of course is to make it predictable, so that despite the acceleration, your brain thinks that the visible cursor is an extension of your hand at all speeds. We don't just use dx/dy as values, rather, we use the pointer velocity. There's a simple reason for that: dx/dy depends on the device's poll rate (or interrupt frequency). 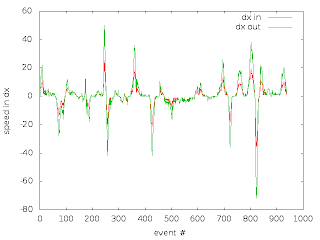 A device that polls twice as often sends half the dx/dy values in each event for the same physical speed. 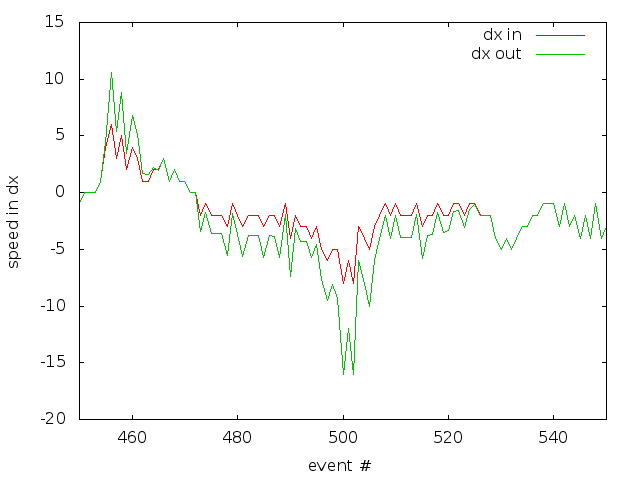 Calculating the velocity is easy: divide dx/dy by the delta time. We use a set of "trackers" that store previous dx/dy values with their timestamp. As long as we get movement in the same cardinal direction, we take those into account. So if we have 5 events in direction NE, the speed is averaged over those 5 events, smoothing out abrupt speed changes. The speed we just calculated is passed to the acceleration function to calculate an acceleration factor. 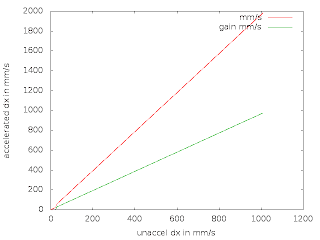 Figure 1: Mapping of velocity in unit/ms to acceleration factor (unitless). X axes here are labelled in units/ms and mm/s. This function is the only place where DEFAULT_THRESHOLD/DEFAULT_ACCELERATION are used, but they mostly just stretch the graph. The shape stays the same. The output of this function is a unit-less acceleration factor that is applied to dx/dy. A factor of 1 means leaving dx/dy untouched, 0.5 is half-speed, 2 is double-speed. 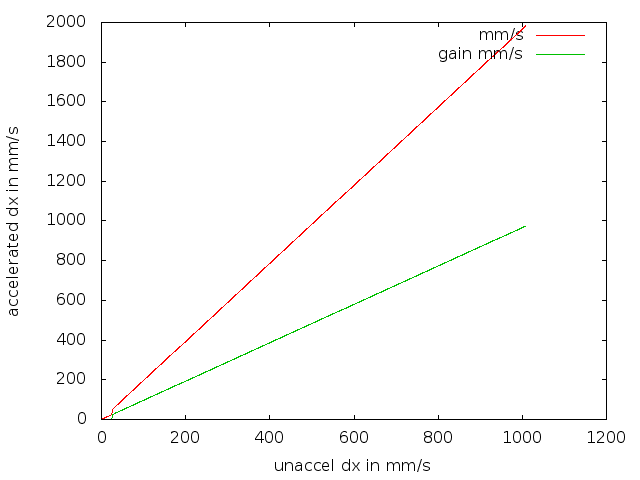 Now we can also put units to the two defaults: Threshold is clearly in units/ms, and the acceleration factor is simply a maximum. Whether those are mentally easy to map is a different question. 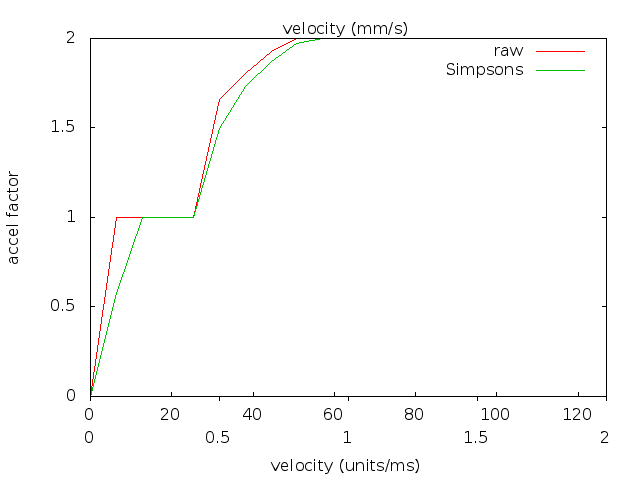 We don't use the output of the function as-is, rather we smooth it out using the Simpson's rule. 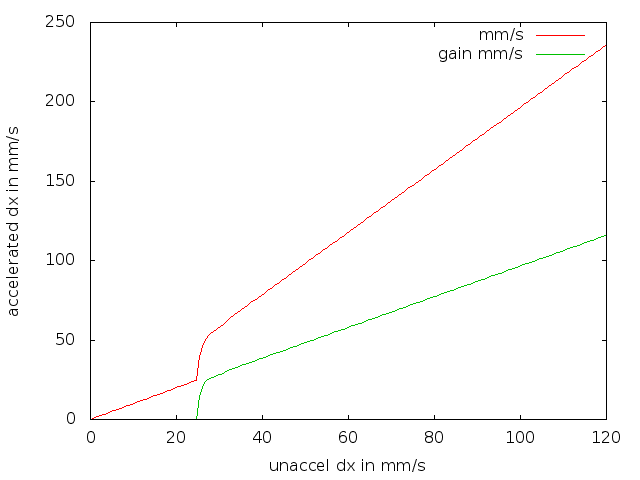 The second (green) curve shows the accel factor after the smoothing took effect. 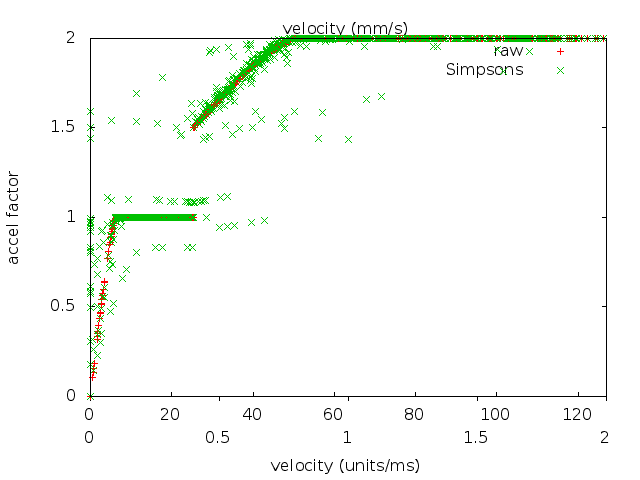 This is a contrived example, the tool to generate this data simply increased the velocity, hence this particular line. For more random data, see Figure 2. 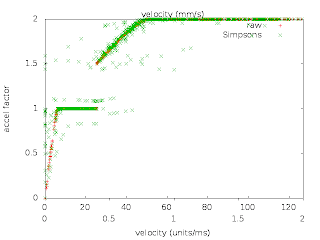 Figure 2: Mapping of velocity in unit/ms to acceleration factor (unitless) for a random data set. X axes here are labelled in units/ms and mm/s. For the data set, I recorded the velocity from libinput while using Firefox a bit. The smoothing takes history into account, so the data points we get depend on the usage. In this data set (and others I tested) we see that the majority of the points still lie on or close to the pure function, apparently the delta doesn't matter that much. Nonetheless, there are a few points that suggest that the smoothing does take effect in some cases. It's important to note that this is already the second smoothing to take effect - remember that the velocity (may) average over multiple events and thus smoothens the input data. 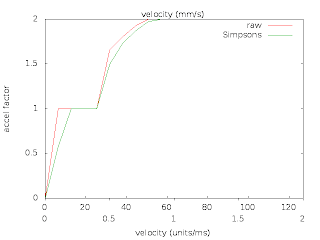 However, the two smoothing effects somewhat complement each other: velocity smoothing only happens when the pointer moves consistently without much change, the Simpson's smoothing effect is most pronounced when the pointer moves erratically. Ok, now we have the basic function, let's look at the effect. 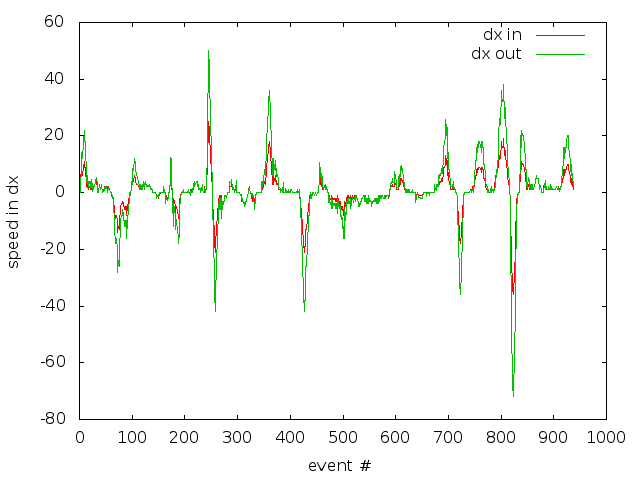 The graph was produced by sending 30 events with the same constant speed, then dividing by the number of events to reduce any effects tracker feeding has at the initial couple of events. The two lines show the actual output speed in mm/s and the gain in mm/s, i.e. (output speed - input speed). We can see that the little nook where the threshold kicks in and after the acceleration is linear. Look at Figure 1 again: the linear acceleration is caused by the acceleration factor maxing out quickly. 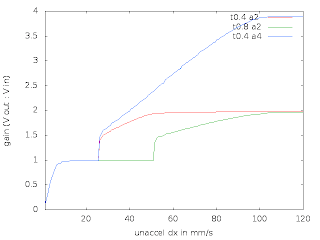 Figure 4: Mapping raw unaccelerated dx to accelerated dx, see Figure 3 for details. Zoomed in to a max of 120 mm/s (15 dx/event). Same data as Figure 3, but zoomed to the realistic range. We go from a linear speed increase (no acceleration) to a quick bump once the threshold is hit and from then on to a linear speed increase once the maximum acceleration is hit. 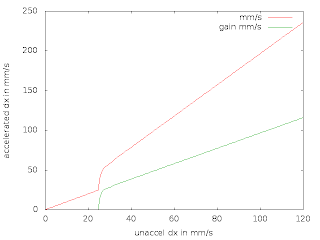 Figure 5: Mapping of the unit-less gain of raw unaccelerated dx to accelerated dx, i.e. the ratio of accelerated:unaccelerated. Looks pretty much exactly like the pure acceleration function, which is to be expected. What's important here though is that this is the effective speed, not some mathematical abstraction. 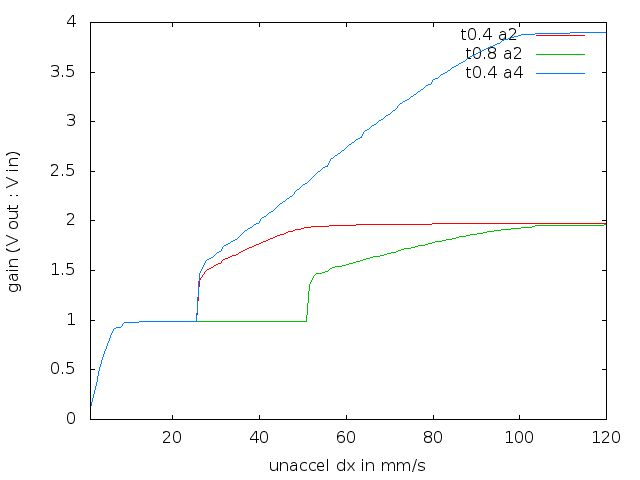 And it shows one limitation: we go from 0 to full acceleration within really small window. Figure 6: Mapping of the unit-less gain of raw unaccelerated dx to accelerated dx, i.e. the ratio of accelerated:unaccelerated. Zoomed in to a max of 120 mm/s (15 dx/event). Same data as Figure 5, just zoomed in to a maximum of 120 mm/s. If we assume that 15 dx/event is roughly the maximum you can reach with a mouse you'll see that we've reached maximum acceleration at a third of the maximum speed and the window where we have adaptive acceleration is tiny. Tweaking threshold/accel doesn't do that much. Below are the two graphs representing the default (threshold=0.4, accel=2), a doubled threshold (threshold=0.8, accel=2) and a doubled acceleration (threshold=0.4, accel=4). Figure 6: Mapping raw unaccelerated dx to accelerated dx, see Figure 3 for details. Zoomed in to a max of 120 mm/s (15 dx/event). 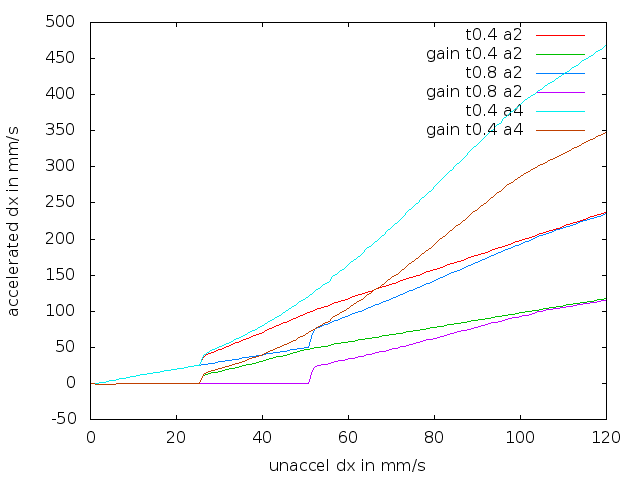 Graphs represent thresholds:accel settings of 0.4:2, 0.8:2, 0.4:4. 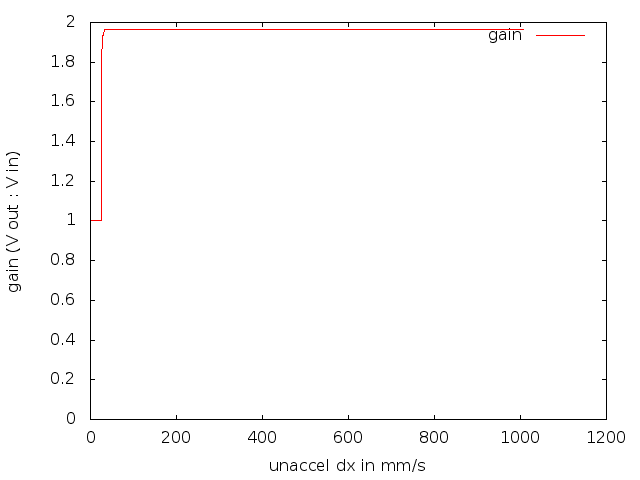 Figure 7: Mapping of the unit-less gain of raw unaccelerated dx to accelerated dx, see Figure 5 for details. Zoomed in to a max of 120 t0.4 a4 (15 dx/event). 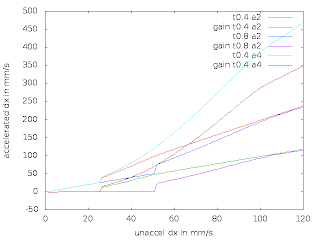 Graphs represent thresholds:accel settings of 0.4:2, 0.8:2, 0.4:4. Doubling either setting just moves the adaptive window around, it doesn't change that much in the grand scheme of things. 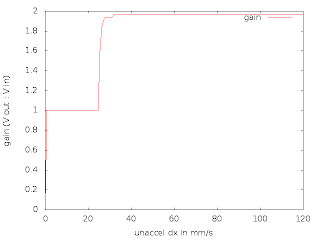 Figure 8: Mapping raw unaccelerated dx to accelerated dx on a fixed random data set. Figure 9: Mapping raw unaccelerated dx to accelerated dx on a fixed random data set, zoomed in to events 450-550 of that set. This is more-or-less random movement reflecting some real-world usage. What I find interesting is that it's very hard to see any areas where smoothing takes visible effect. the accelerated curve largely looks like a stretched input curve. tbh I'm not sure what I should've expected here and how to read that, pointer acceleration data in real-world usage is notoriously hard to visualize. So in summary: I think there is room for improvement. We have no acceleration up to the threshold, then we accelerate within too small a window. Acceleration stops adjusting to the speed soon. This makes us lose precision and small speed changes are punished quickly. Increasing the threshold or the acceleration factor doesn't do that much. Any increase in acceleration makes the mouse faster but the adaptive window stays small. Any increase in threshold makes the acceleration kick in later, but the adaptive window stays small. We've already merged a number of fixes into libinput, but some more work is needed. I think that to get a good pointer acceleration we need to get a larger adaptive window [Citation needed]. We're currently working on that (and figuring out how to evaluate whatever changes we come up with). The biggest issue I was struggling with when trying to understand the code was that of units. The code didn't document used units anywhere but it turns out that everything was either in device units ("mickeys"), device units/ms or (in the case of the acceleration factors) was unitless. Device units are unfortunately a pretty useless base entity, only slightly more precise than using the length of a piece of string. A device unit depends on the device resolution and of course that differs between devices. An average USB mouse tends to have 400 dpi (15.75 units/mm) but it's common to have 800 dpi, 1000 dpi and gaming mice go up to 8200dpi. A touchpad can have resolutions of 1092 dpi (43 u/mm), 3277 dpi (129 u/mm), etc. and may even have different resolutions for x and y. This explains why until commit e874d09b4 the touchpad felt slower than a "normal" mouse. 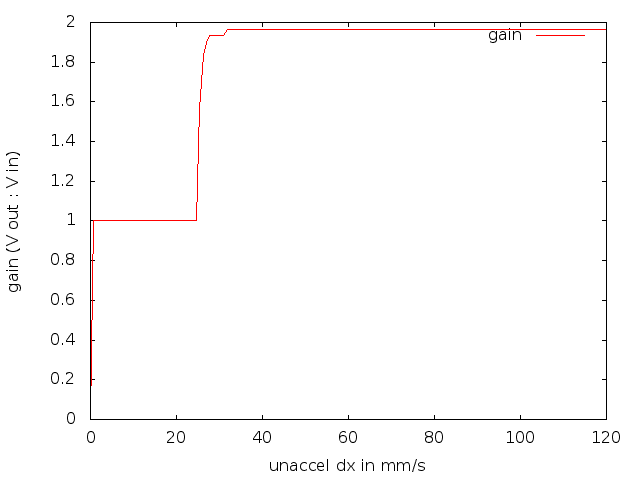 We scaled to a magic constant of 10 units/mm, before hitting the pointer acceleration code. Now, as said above the mouse would likely have a resolution of 15.75 units/mm, making it roughly 50% faster. The acceleration would kick in earlier on the mouse, giving the touchpad and the mouse not only different speeds but a different feel altogether. Unfortunately, there is not much we can do about mice feeling different depending on the resolution. To my knowledge there is no way to query the resolution on a device. But for absolute devices that need pointer acceleration (i.e. touchpads) we can normalize to a fake resolution of 400 dpi and base the acceleration code on that. This provides the same feel on the mouse and the touchpad, as much as that is possible anyway.